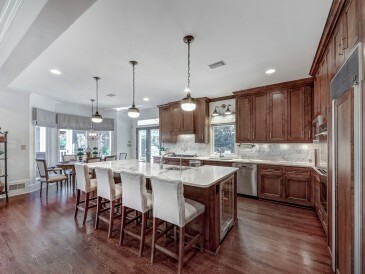 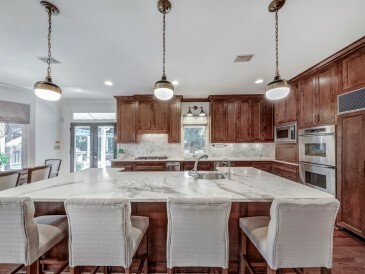 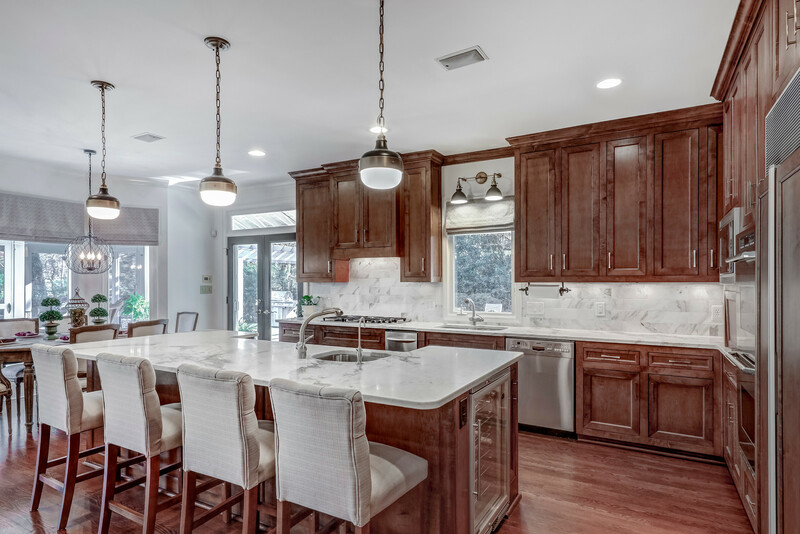 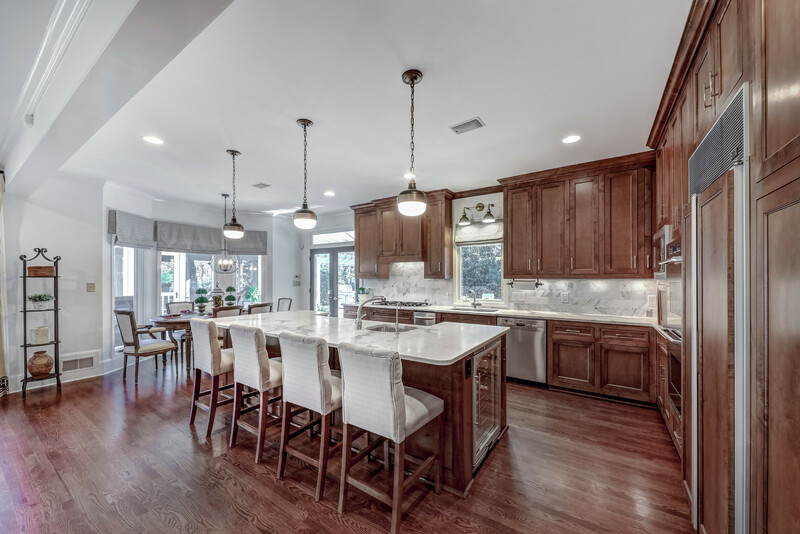 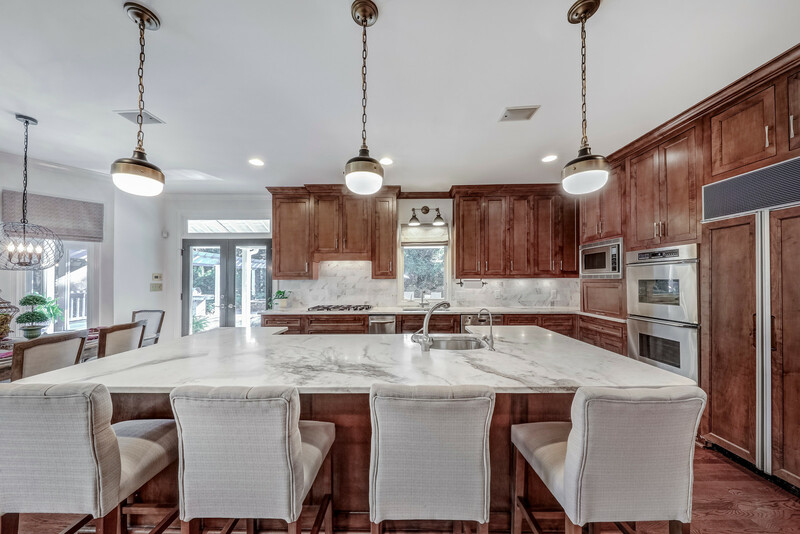 The gourmet kitchen has a large island with honed Carrera marble countertops, custom cabinets and stainless appliances including Bosch dishwasher, Dacor double ovens, Dacor 5-burner gas cooktop, 42 bottle Vino Temp built-in wine fridge and Sub-Zero refrigerator. 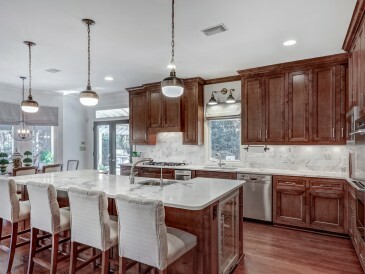 The kitchen island has a vegetable/bar sink with purified water dispenser. 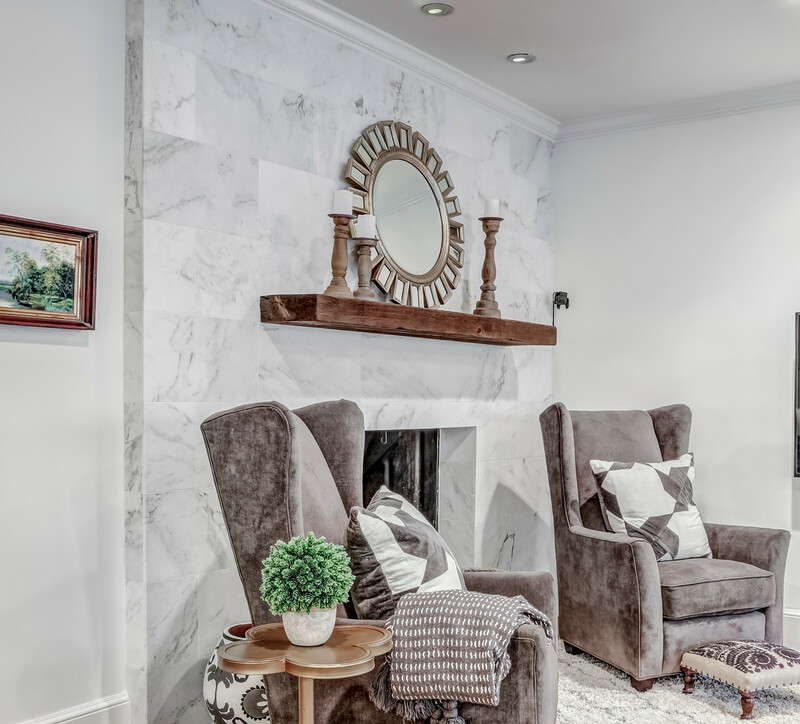 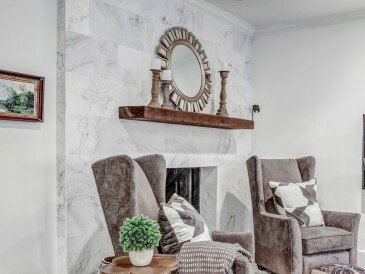 The kitchen opens to a breakfast room with bay window and light-filled family room featuring marble fireplace with gas logs and custom-built cedar plank mantle. 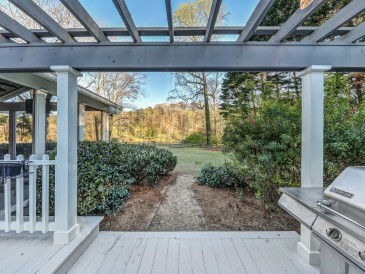 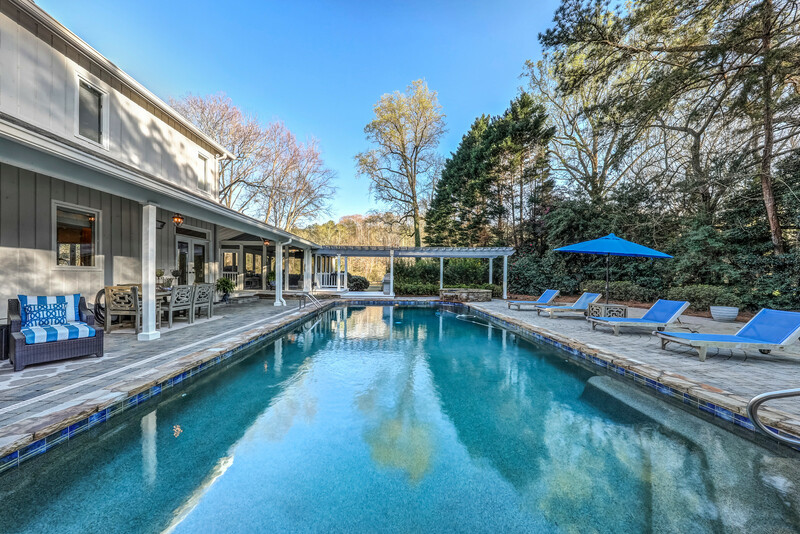 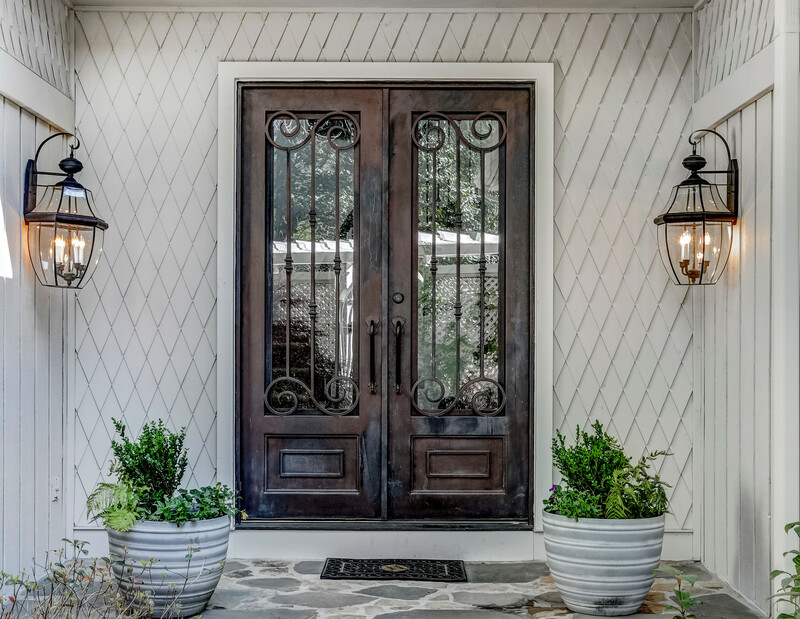 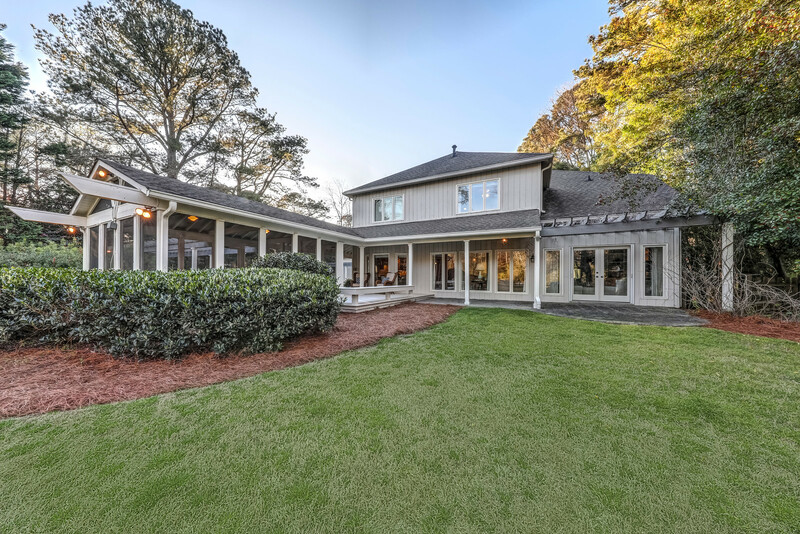 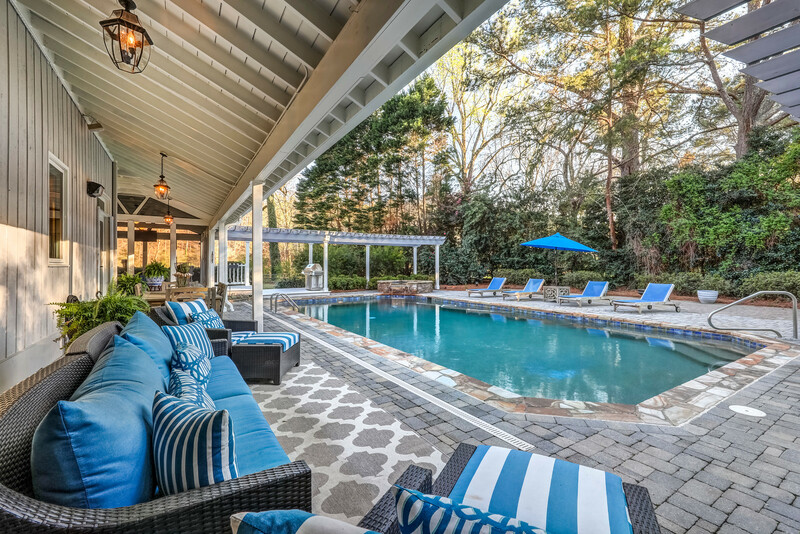 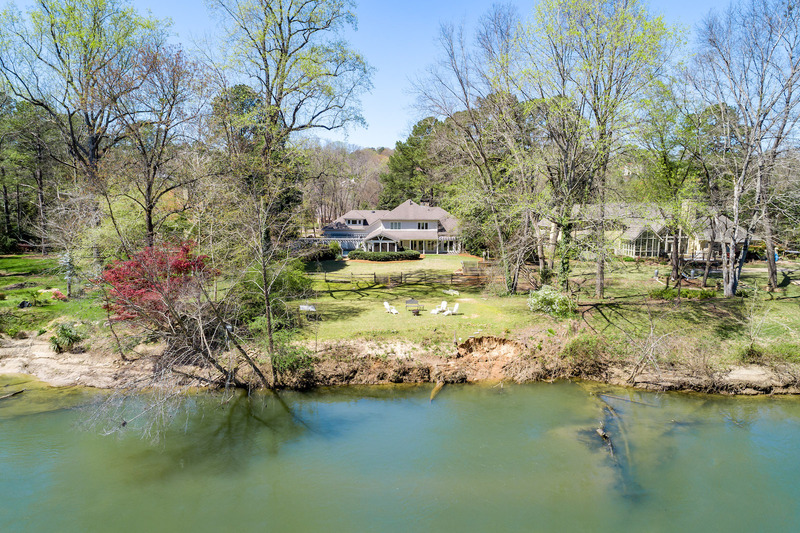 Expansive windows across the back of the home provide sweeping panoramic views of the Chattahoochee River, beautifully landscaped, flat private backyard as well in-ground pool, oversized screened porch with shiplap vaulted ceiling and 94′ of Chattahoochee river frontage. 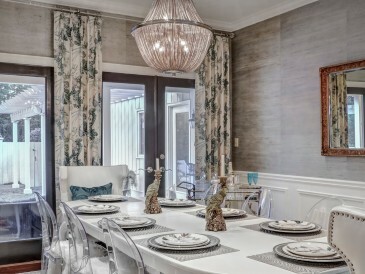 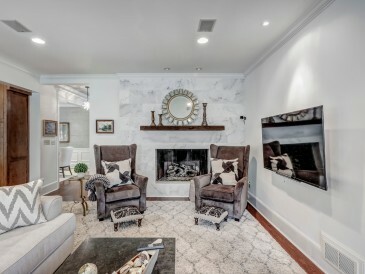 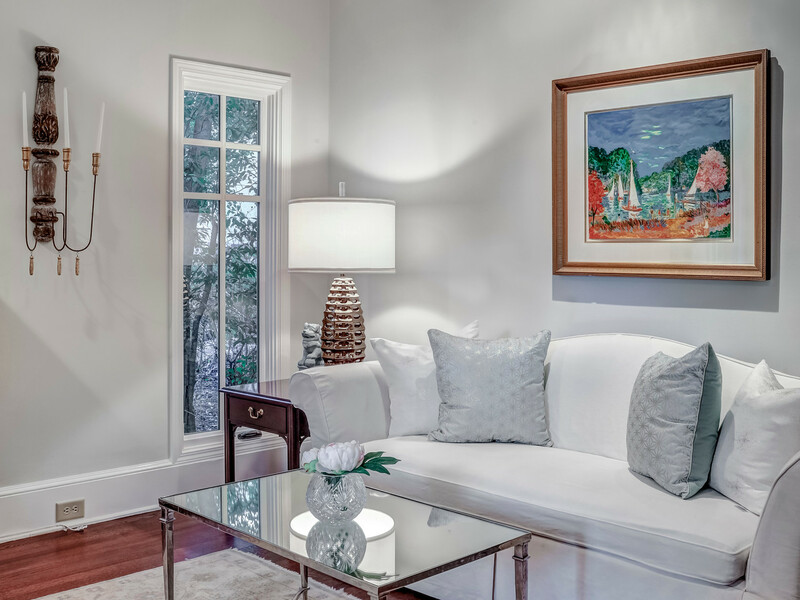 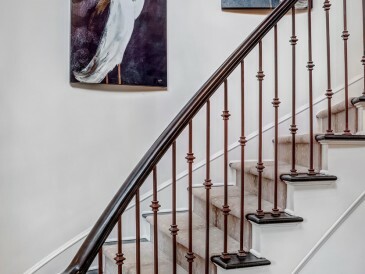 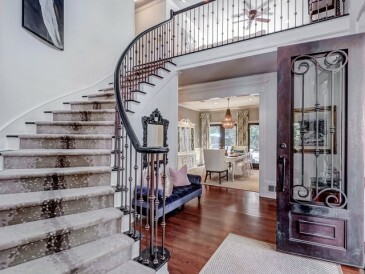 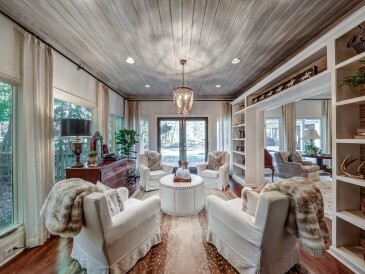 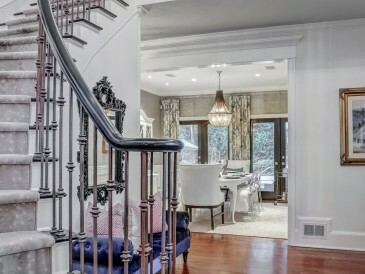 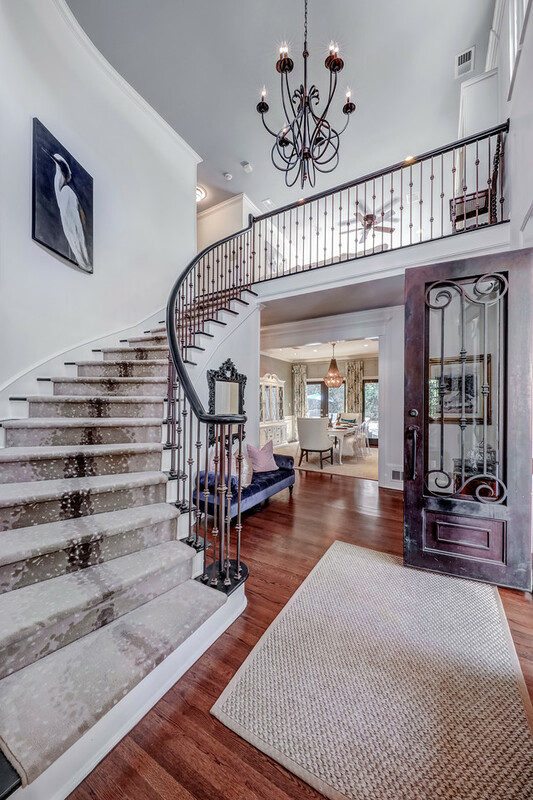 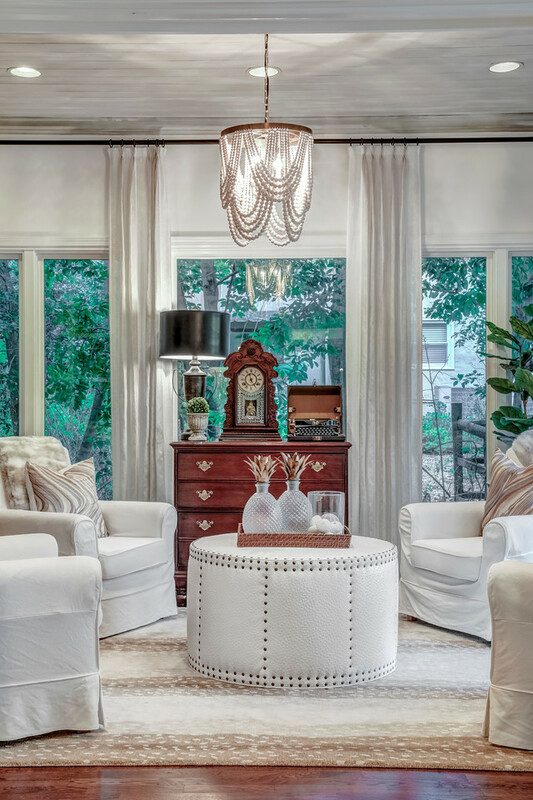 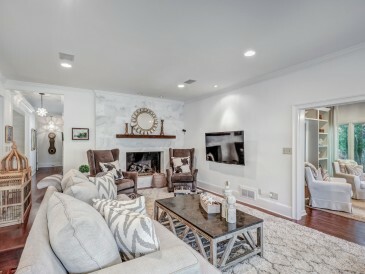 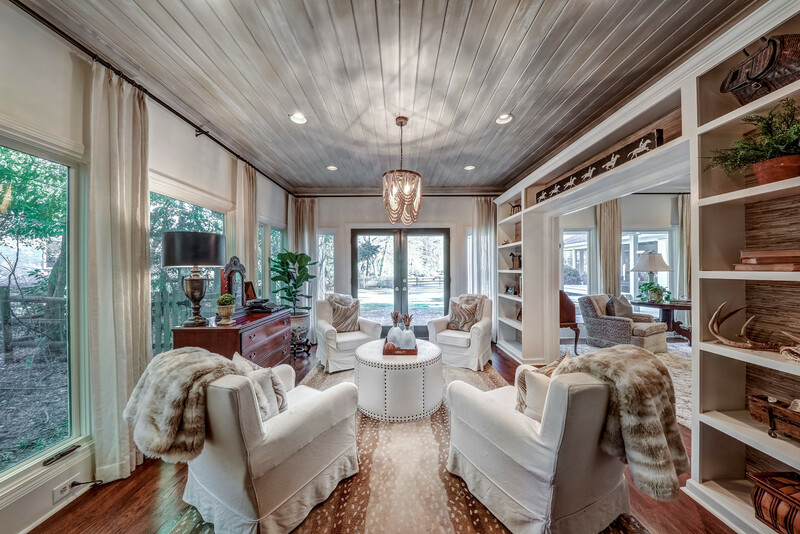 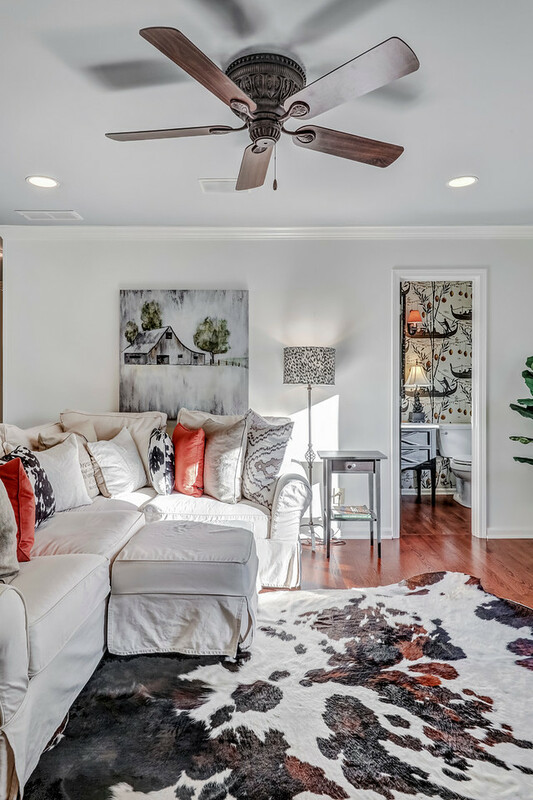 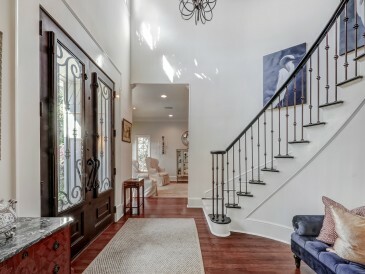 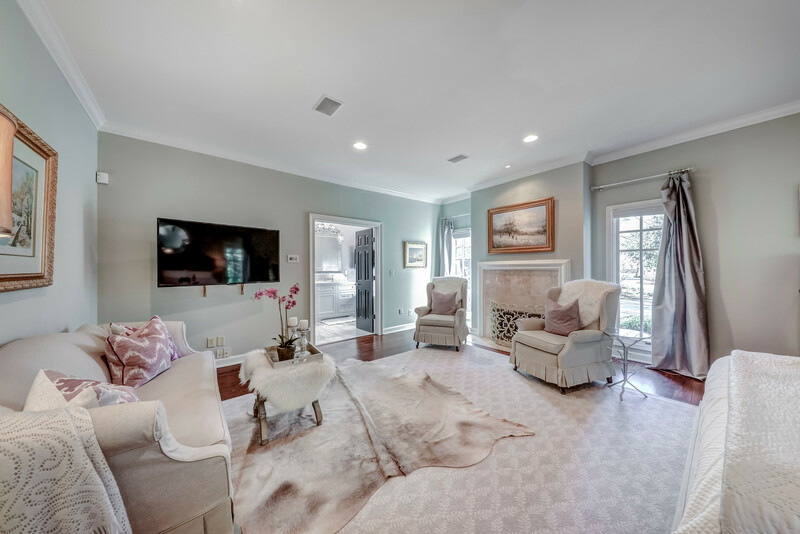 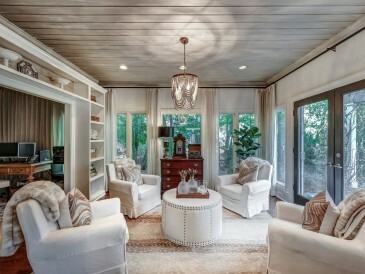 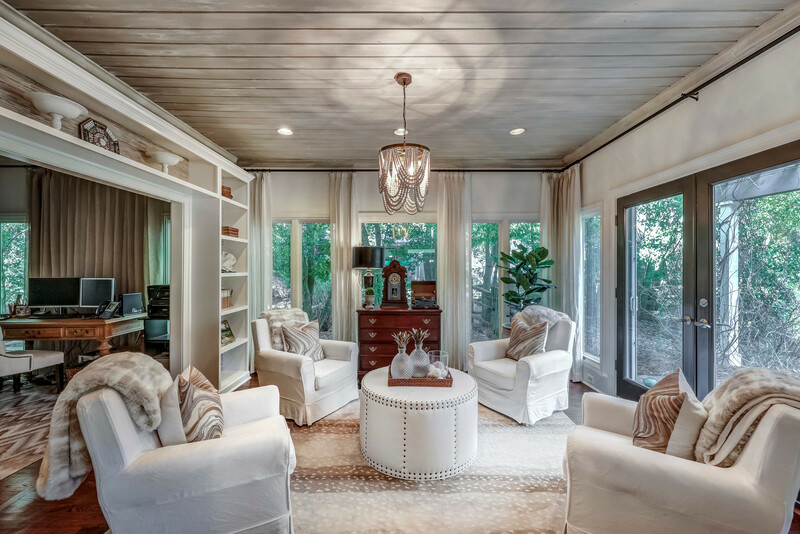 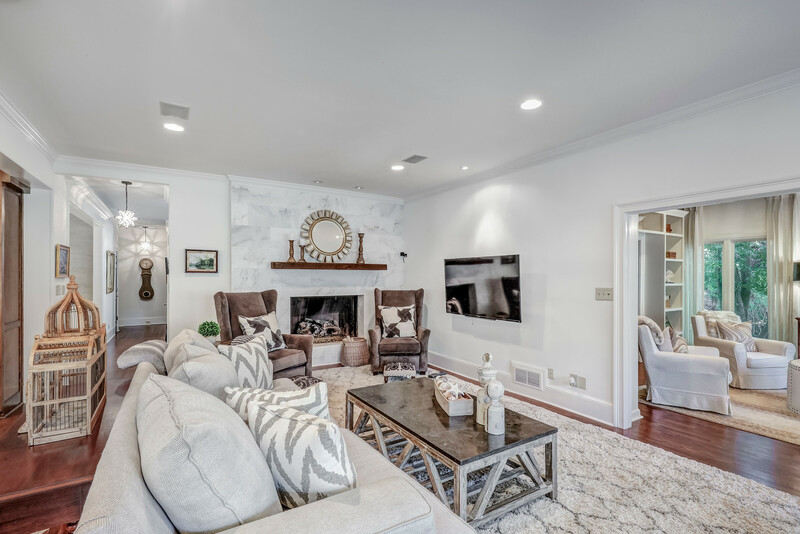 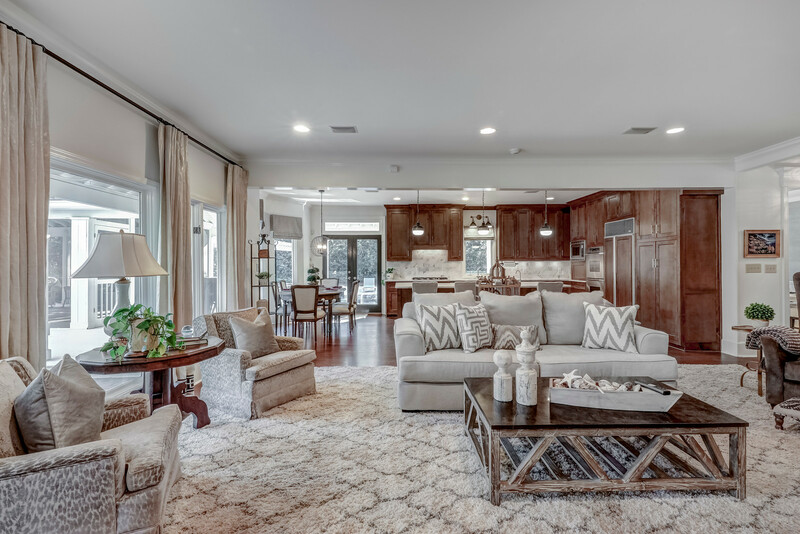 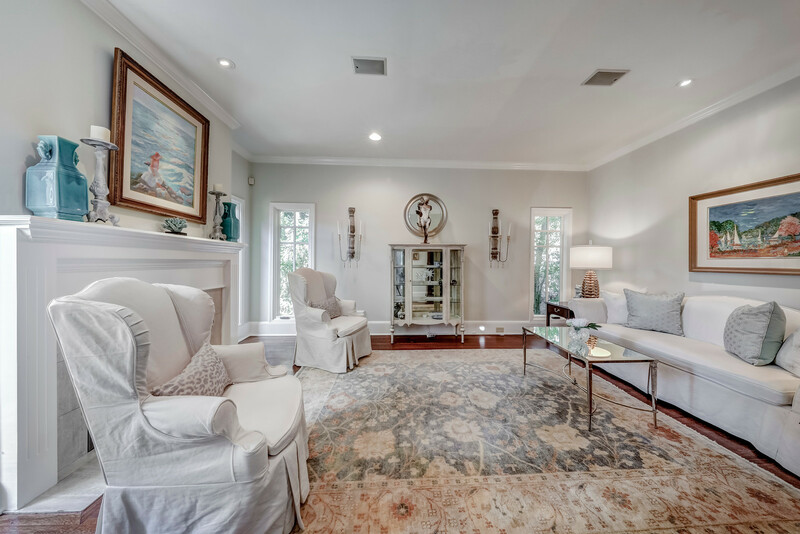 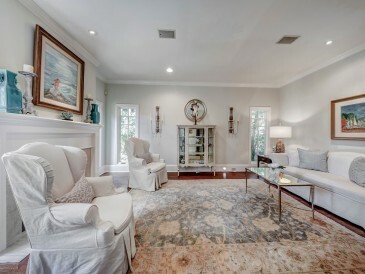 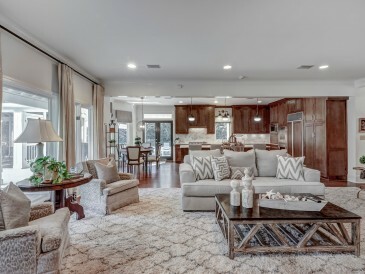 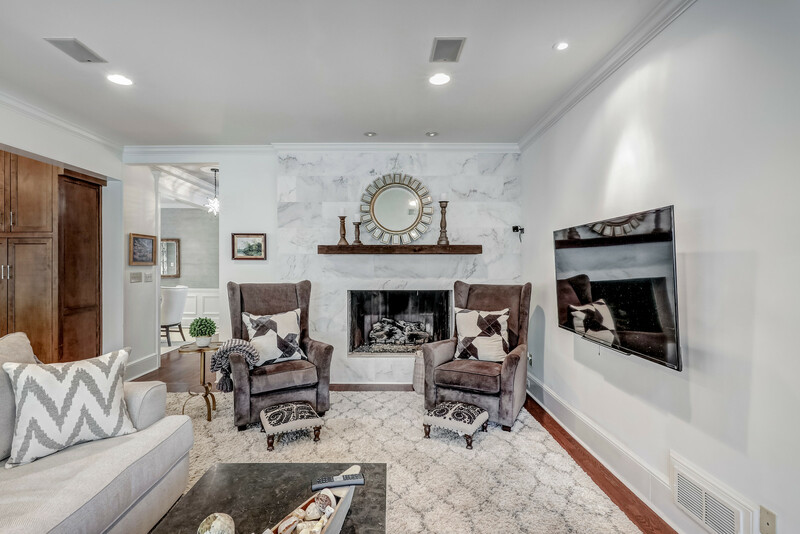 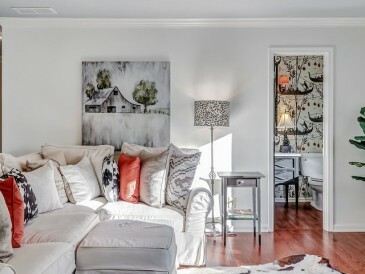 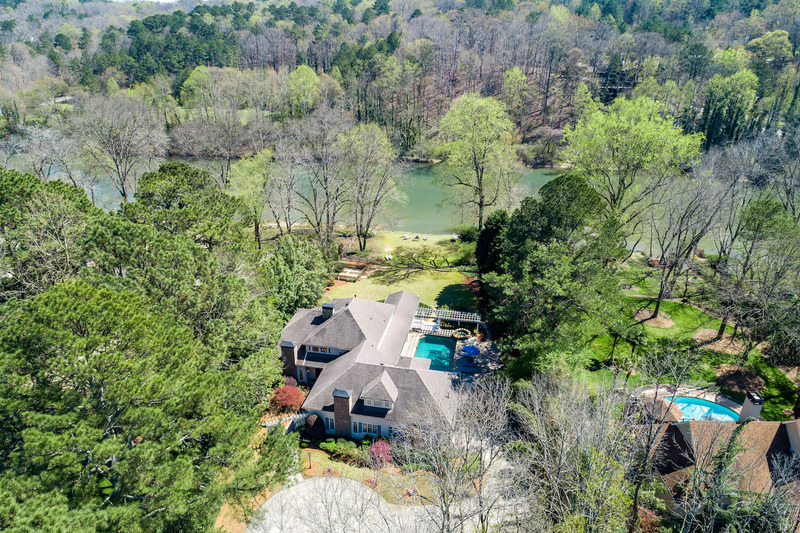 The main level also includes a private tranquil office/study nestled next to trees with a light-filled sunroom that has built-in bookcases, custom stained shiplap ceiling and French doors with stunning river views. 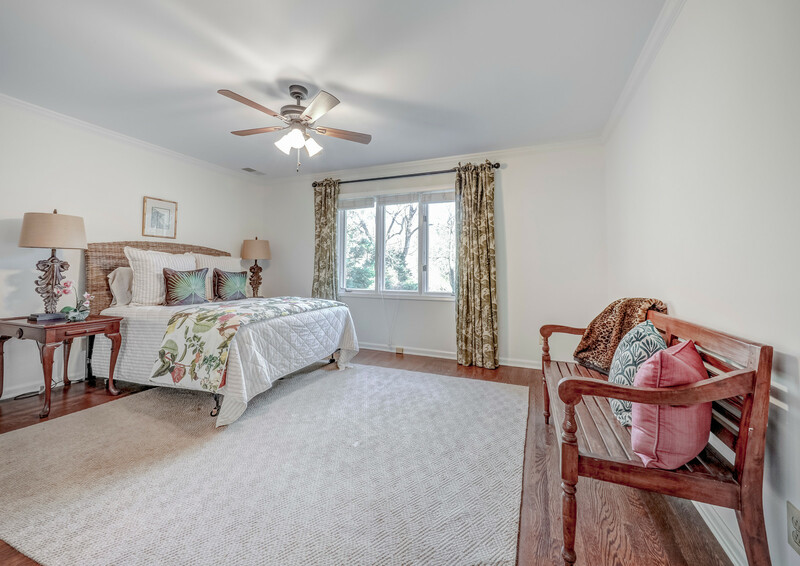 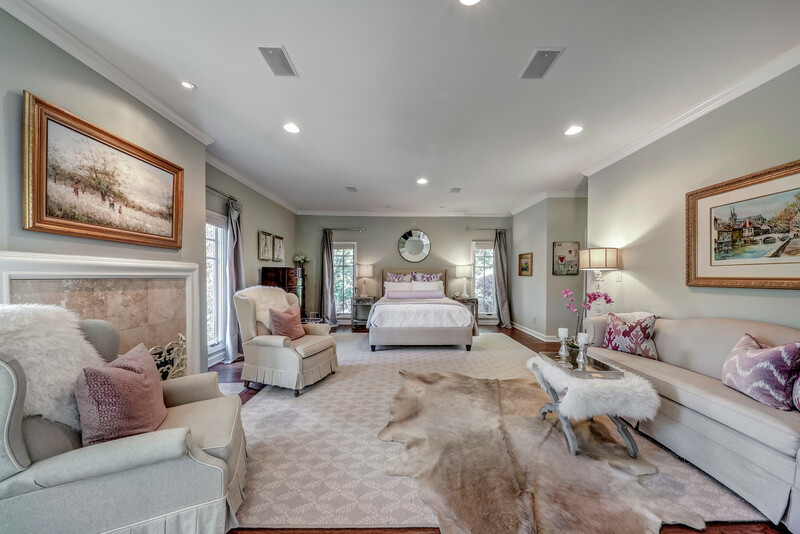 Master bedroom on main includes large sitting room, gas fireplace and his/her walk-in closets. 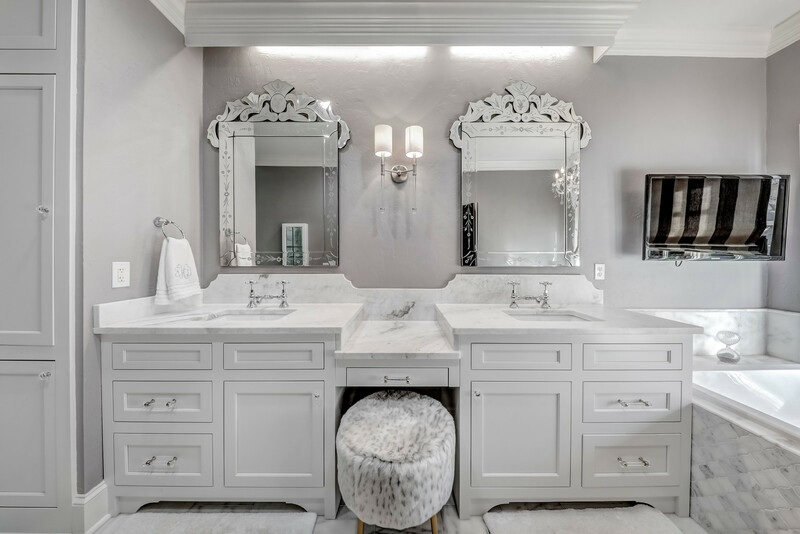 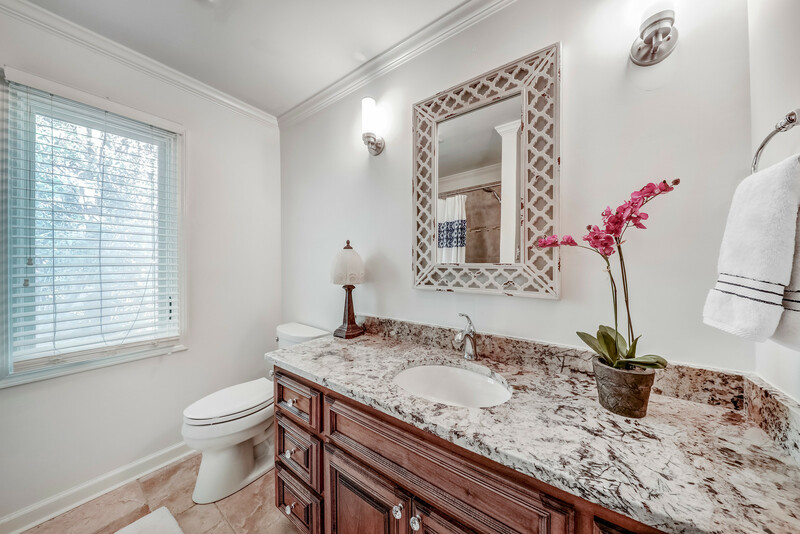 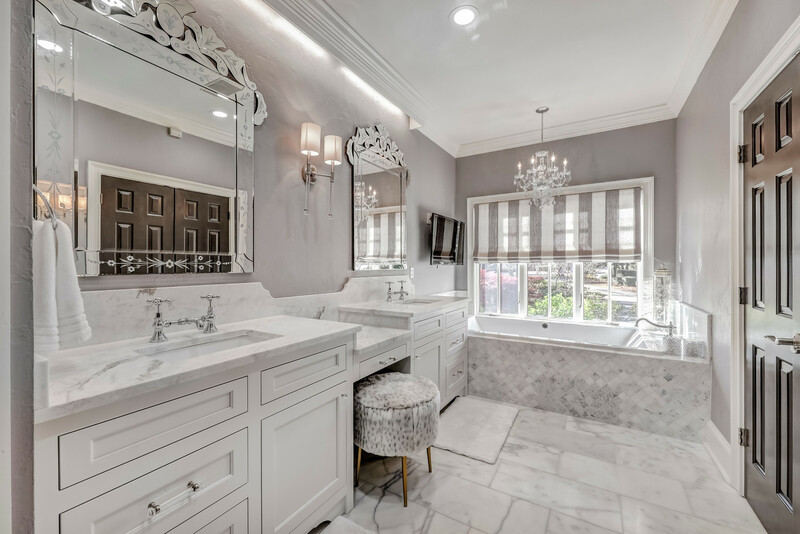 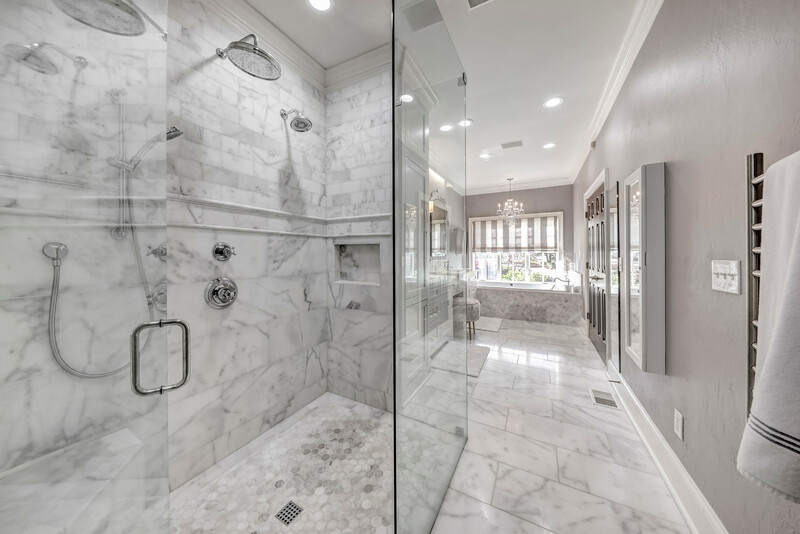 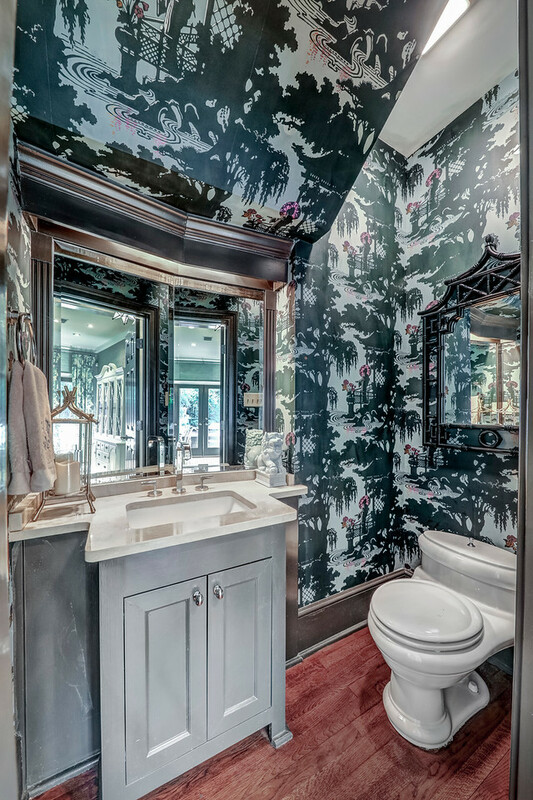 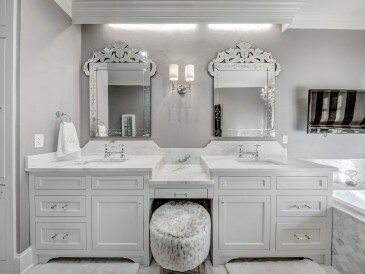 The renovated master bath is a private spa-like retreat with Carrera marble floors, custom cabinets with honed marble countertops, Bubble-Jet, hydrotherapy soaking tub, towel warmer and oversized frameless marble shower with rainhead, hand-held shower and traditional shower head. 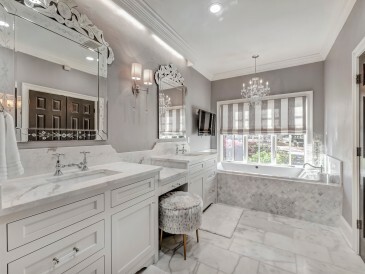 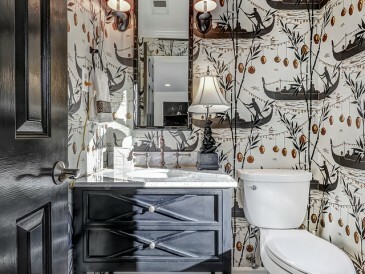 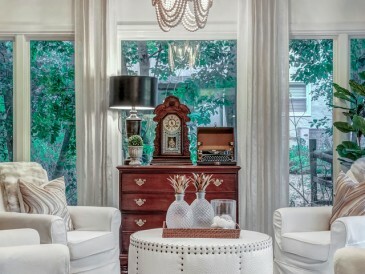 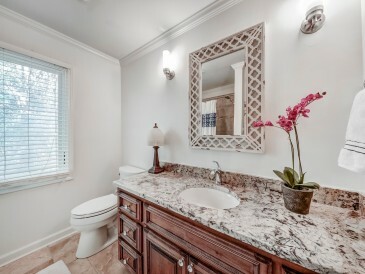 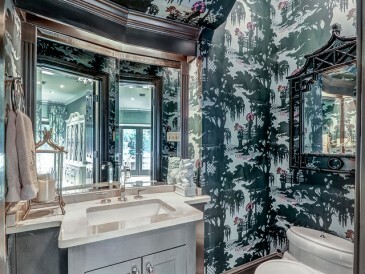 The master bath also has a jewelry cabinet, remote controlled window shade and sparkling chandelier. 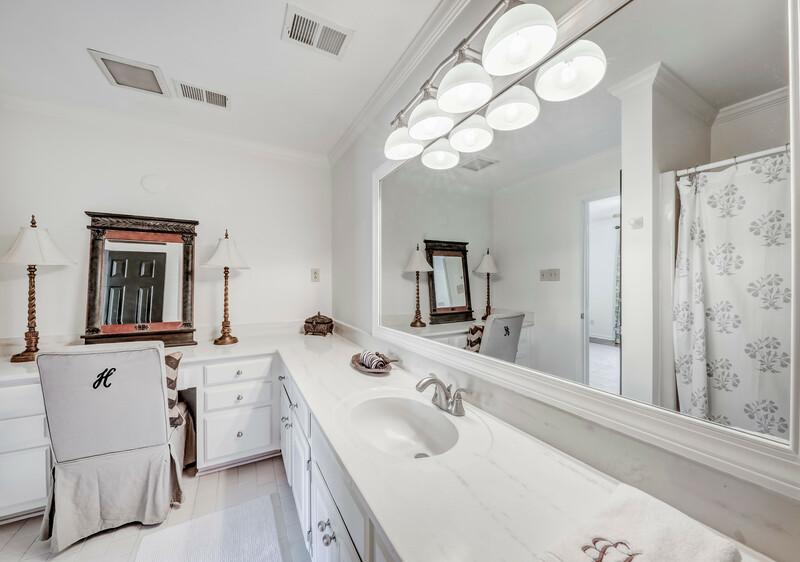 Also included on this level is a laundry room, powder room, full bath and oversized two-car side-entry garage with built-in shelving and a large storage closet. 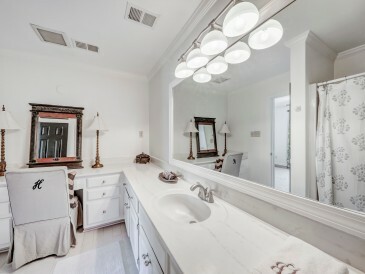 The laundry room has storage cabinets, a built-in ironing board and built-in drying shelf and rack. 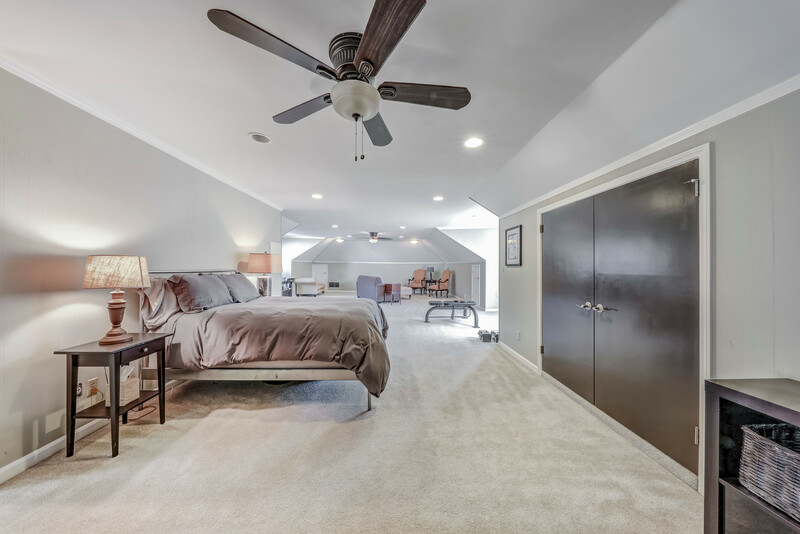 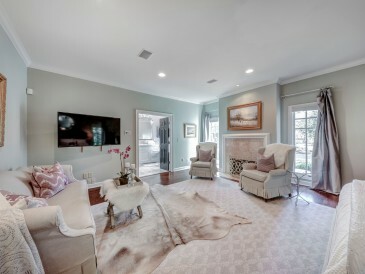 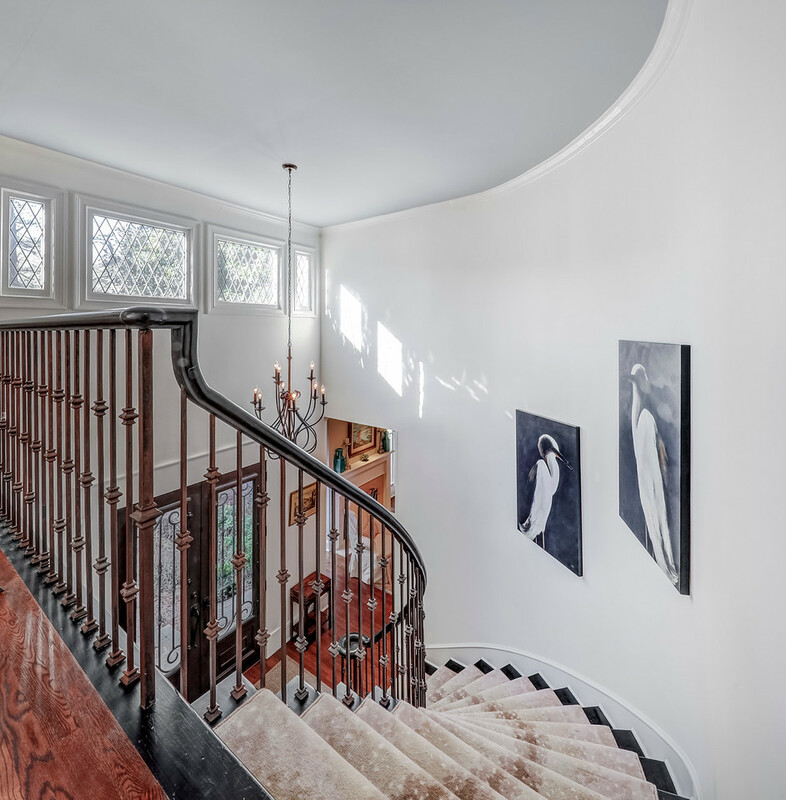 Upstairs features a media room/bonus room with built-in bookcases and half bath. 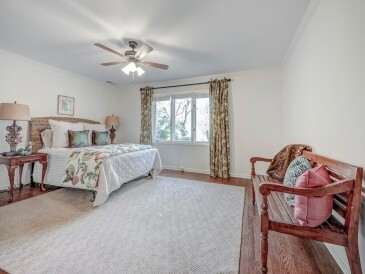 Huge guest suite can be used as exercise room or game room. 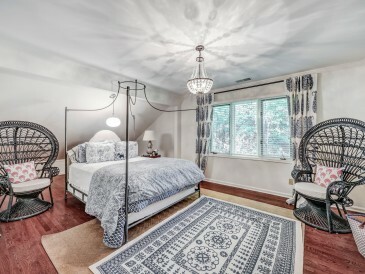 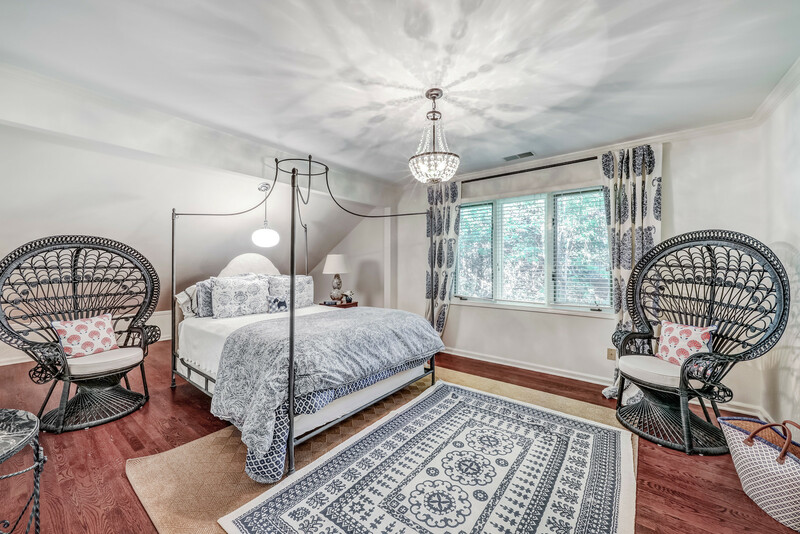 Three additional guest bedroom each with walk-in closets and ensuite baths. 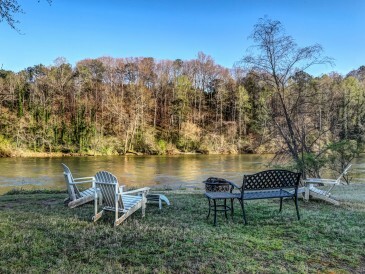 Two of the bedrooms have gorgeous, unobstructed views of the river. 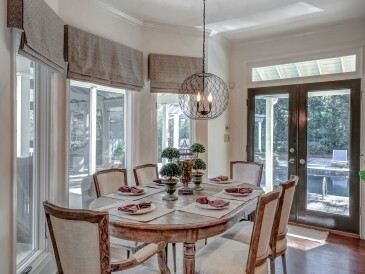 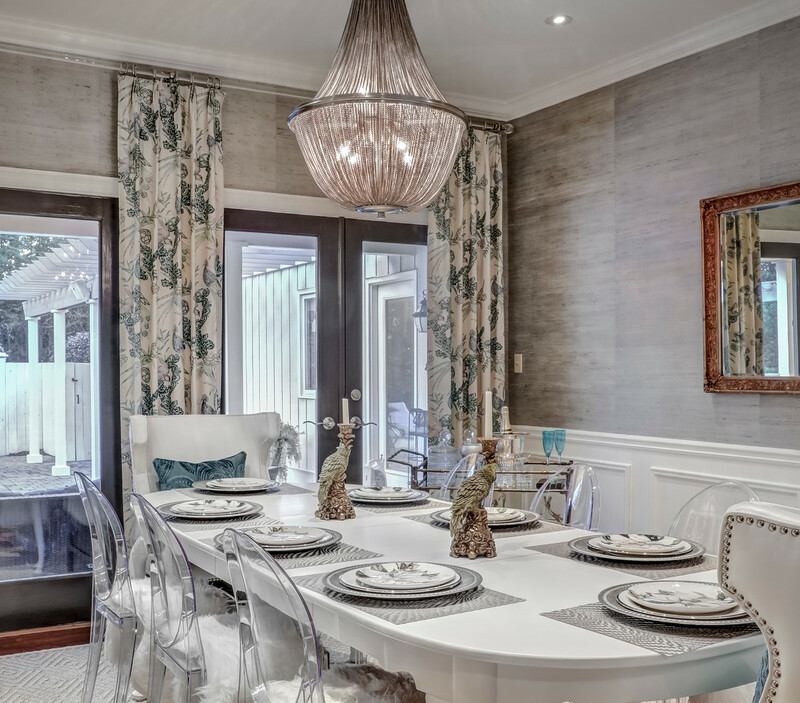 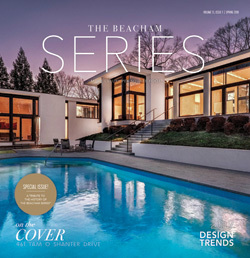 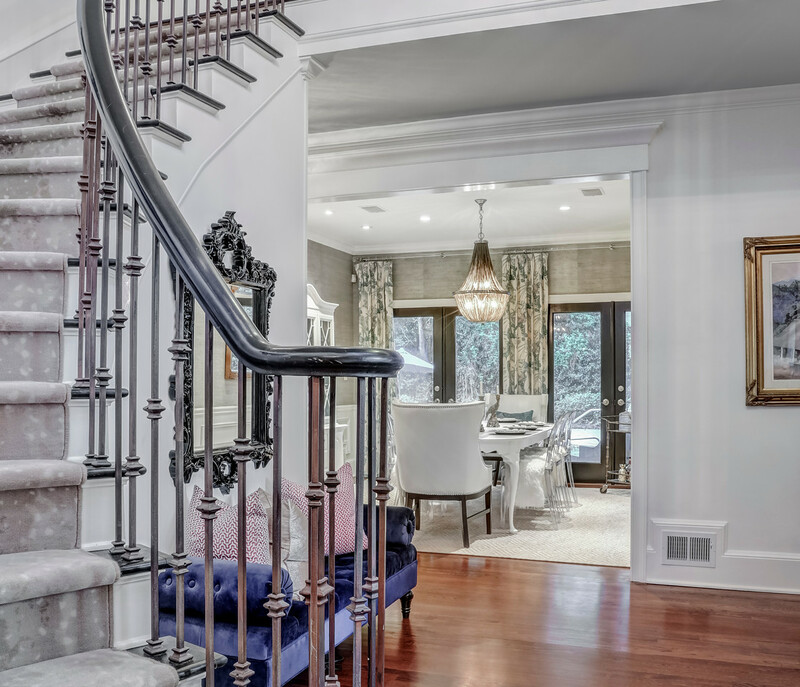 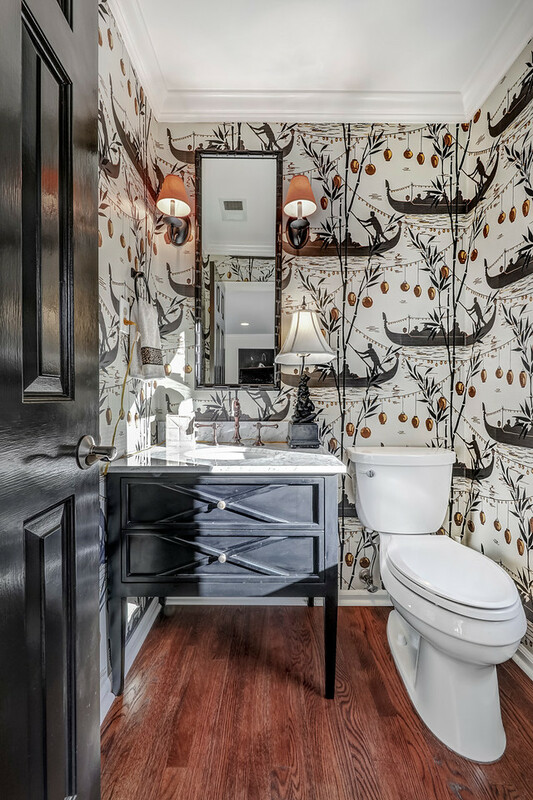 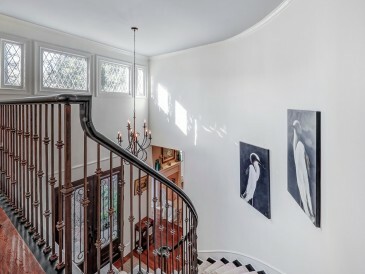 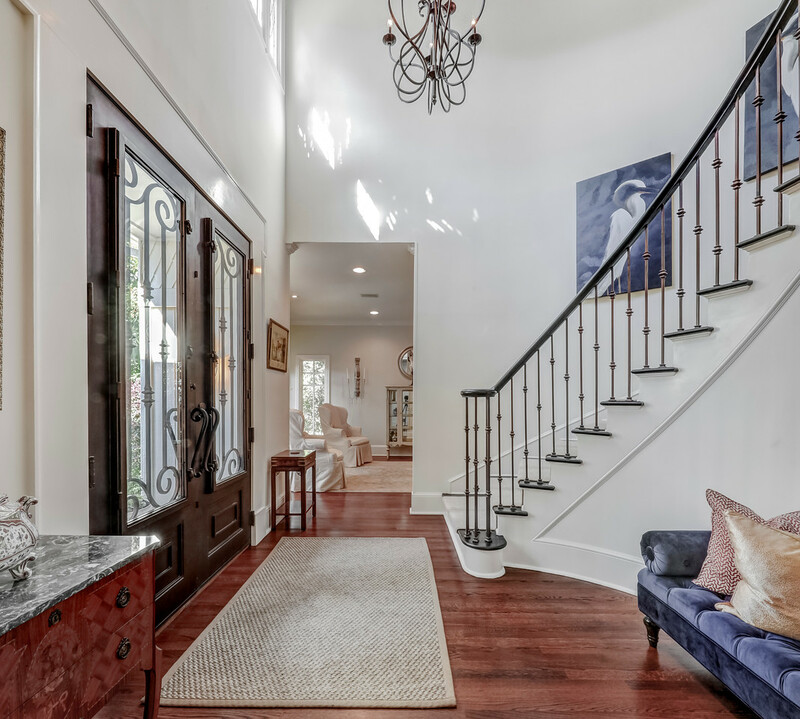 This renovated home is loaded with custom features and finishes by Jennifer Schoenberger with Elle and Vreeland. 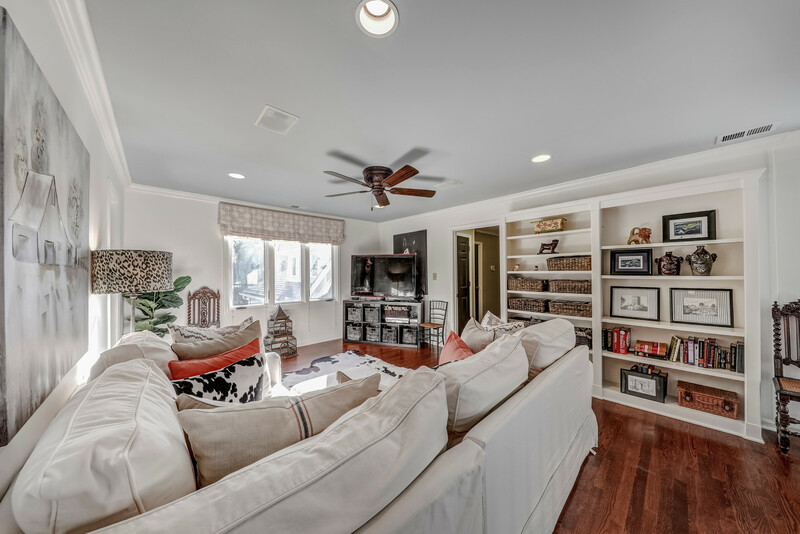 Built-in speakers in master, master bath, living room, family room, kitchen, upstairs media room and outdoor entertaining area. 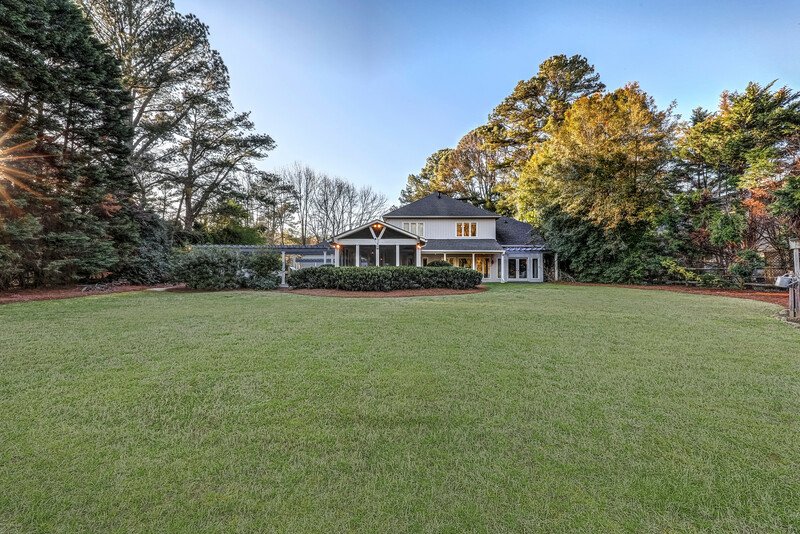 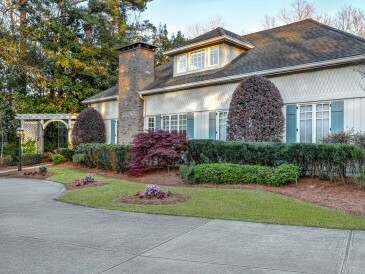 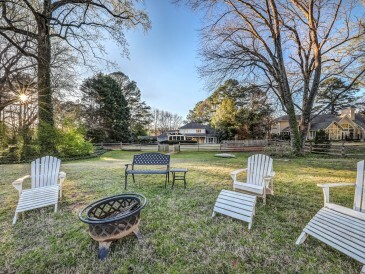 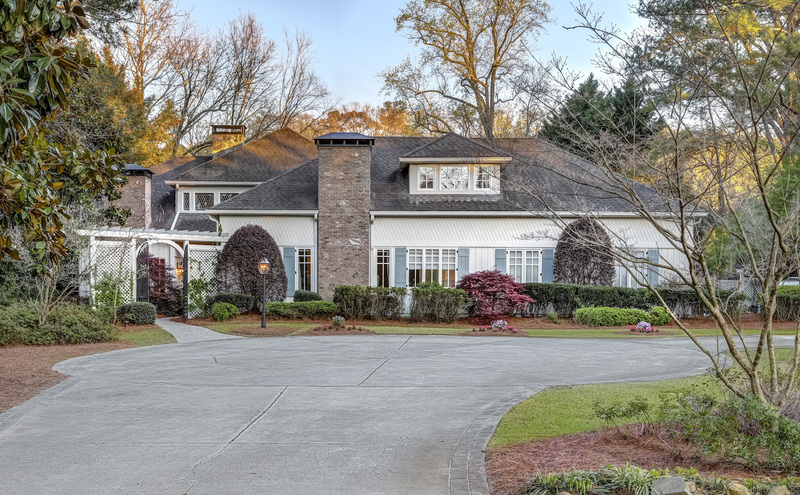 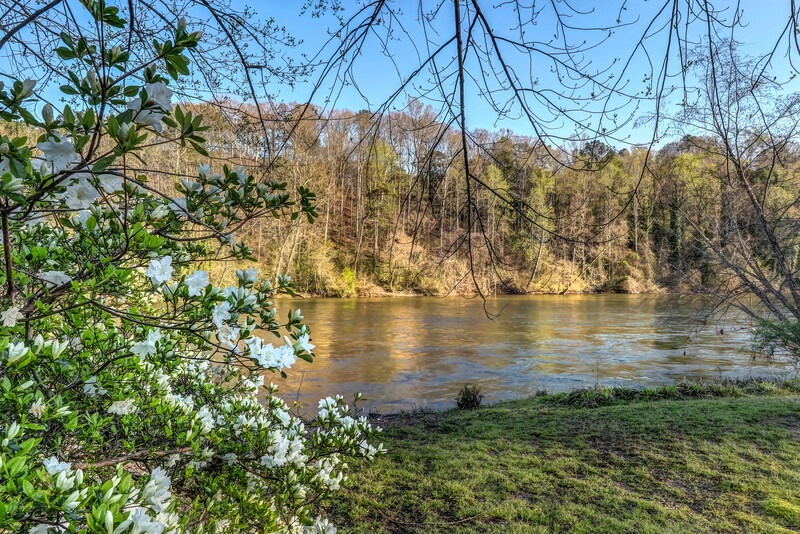 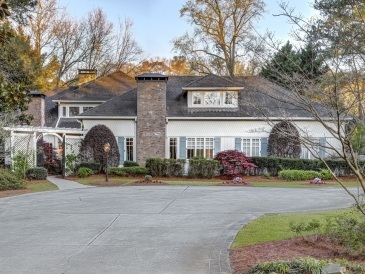 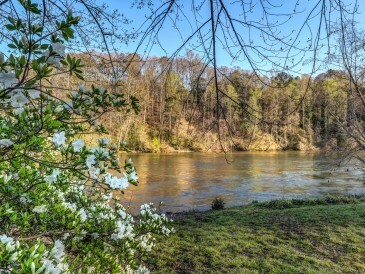 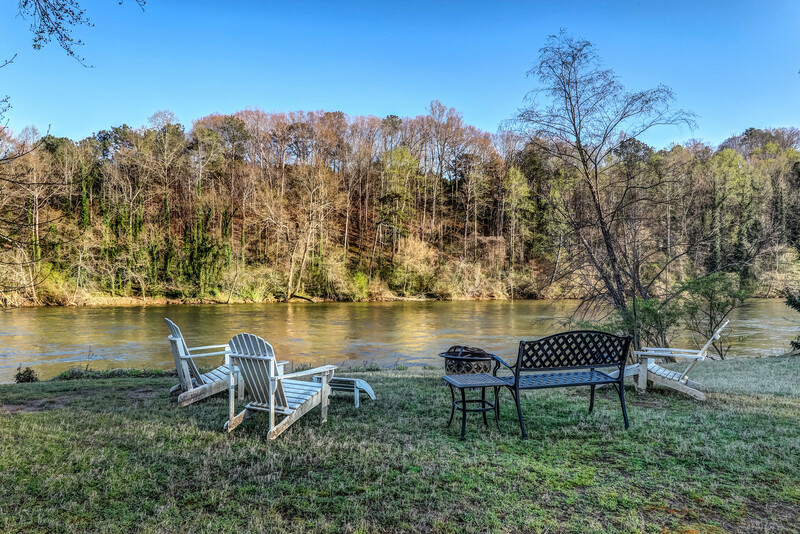 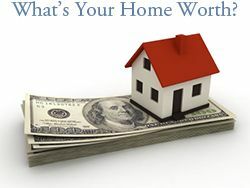 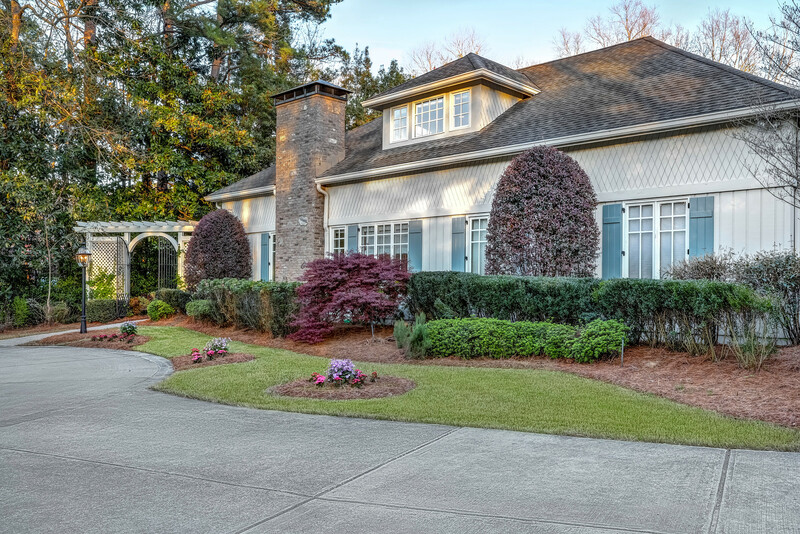 One of the best lots on the Chattahoochee River! 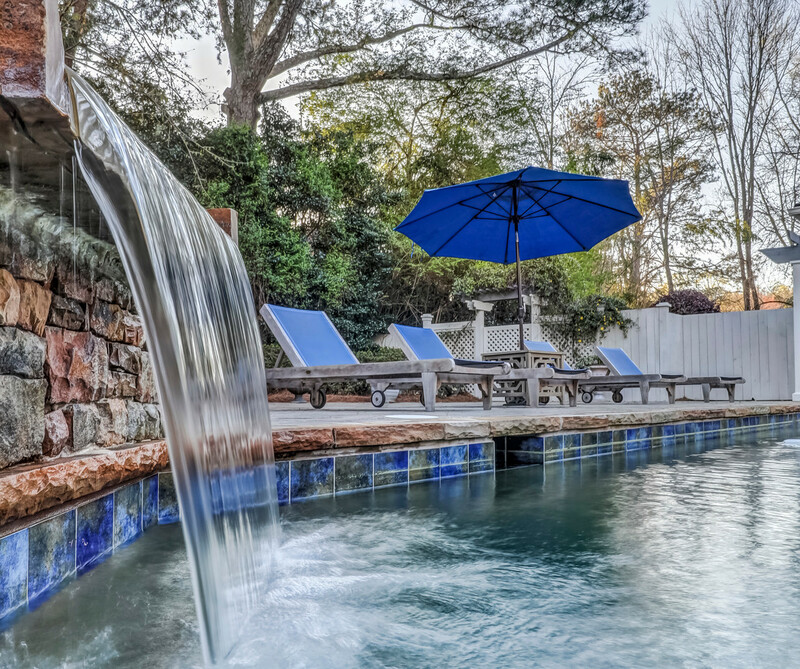 Heated, Pebble-Tec pool with stone patio and large spa with waterfall. 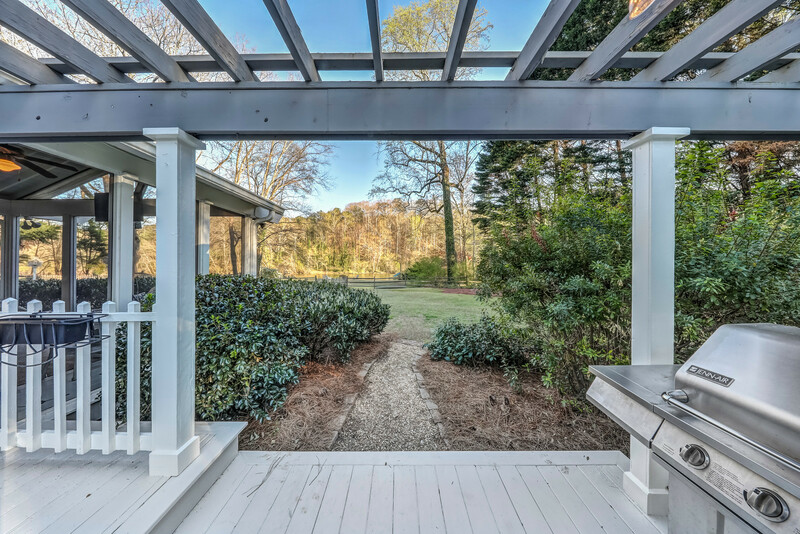 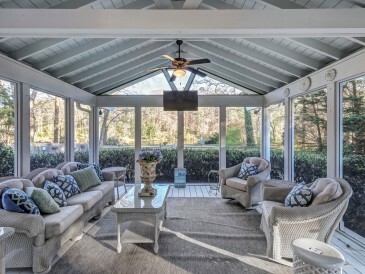 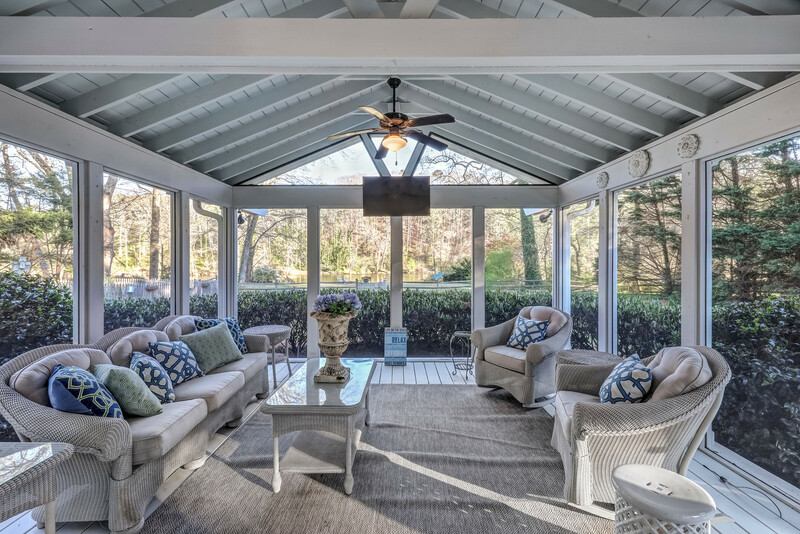 Amazing screen porch with expansive river view is a favorite spot for morning coffee, evening wine, watching sports on the wall-mounted TV or to watch the sunset. 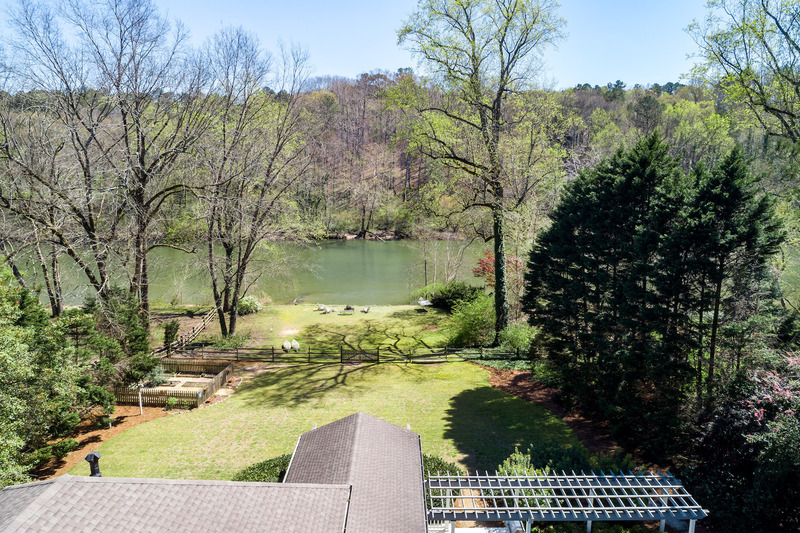 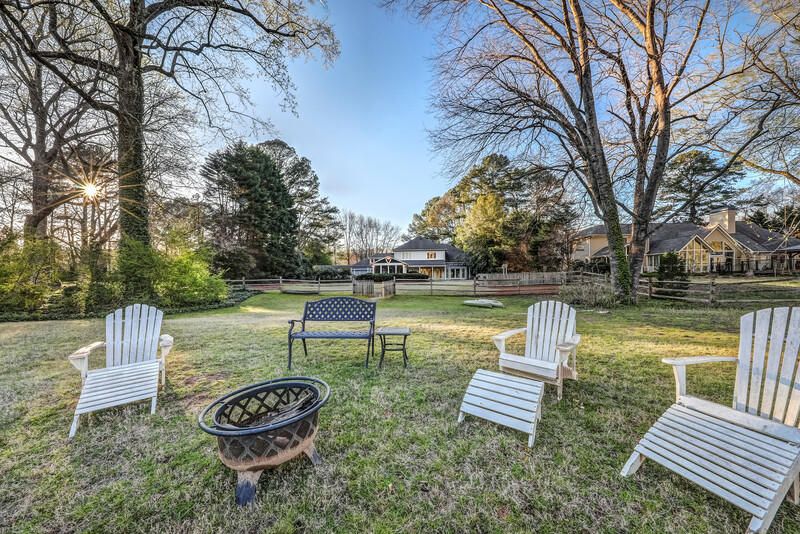 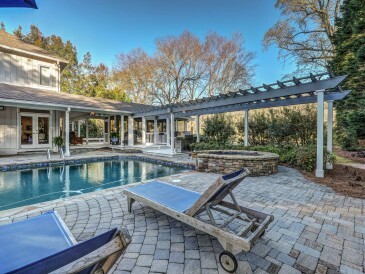 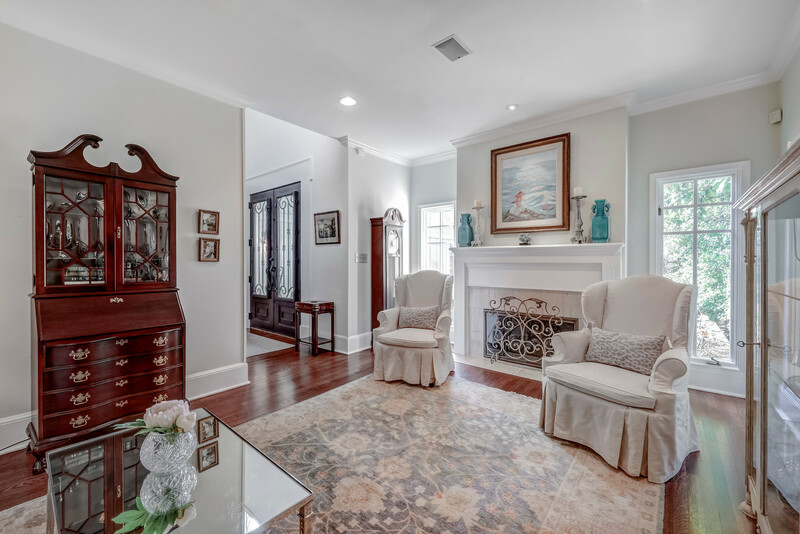 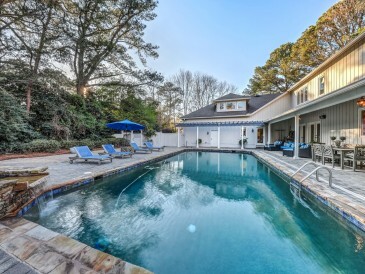 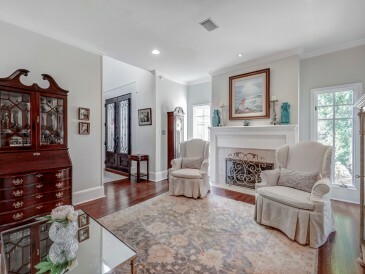 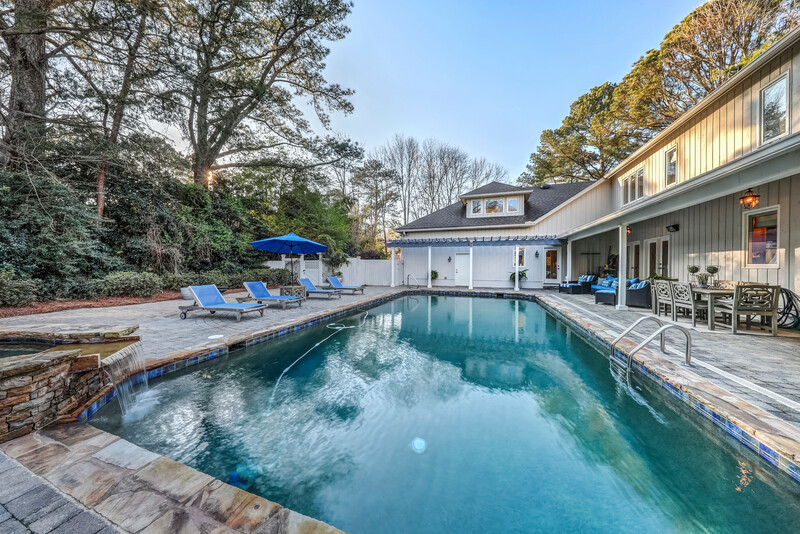 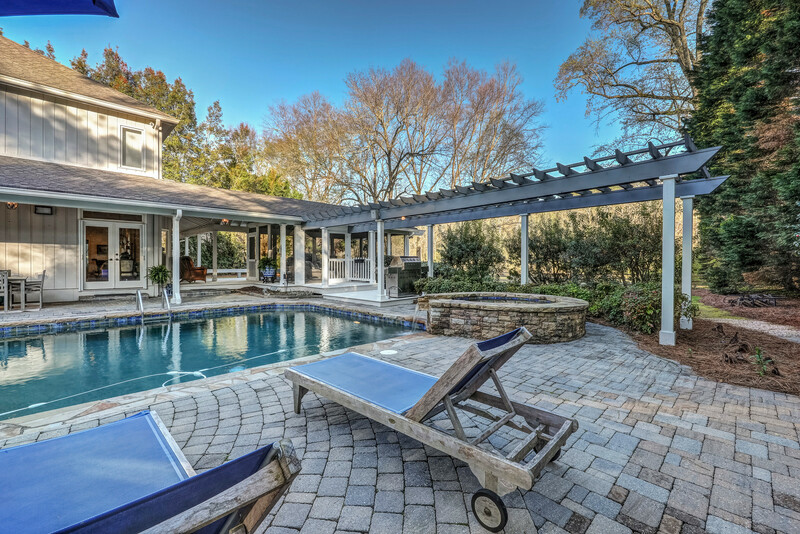 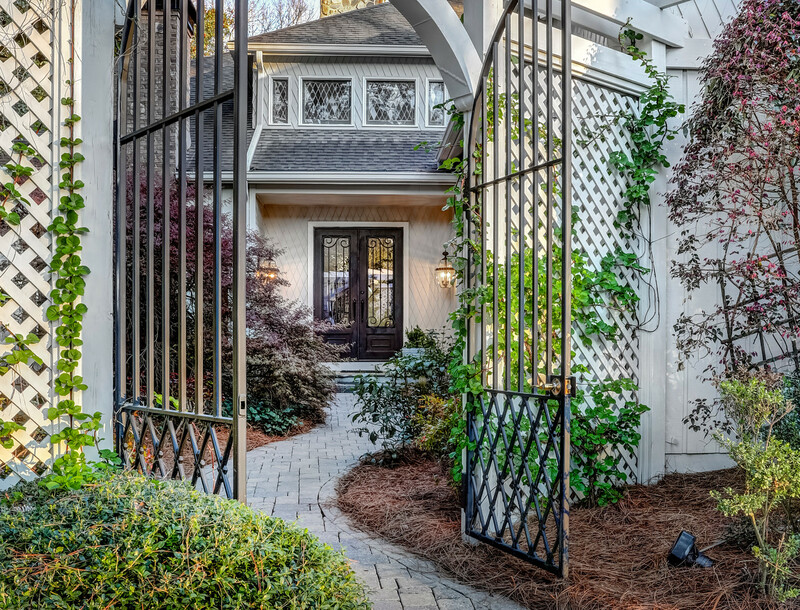 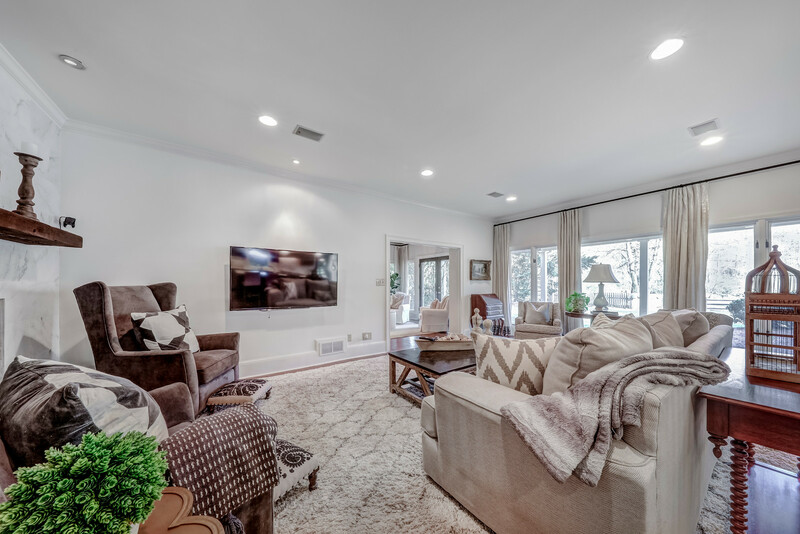 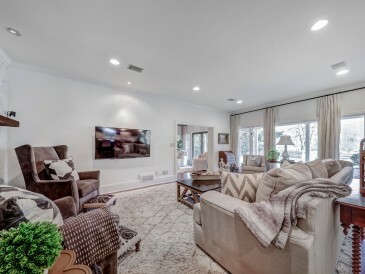 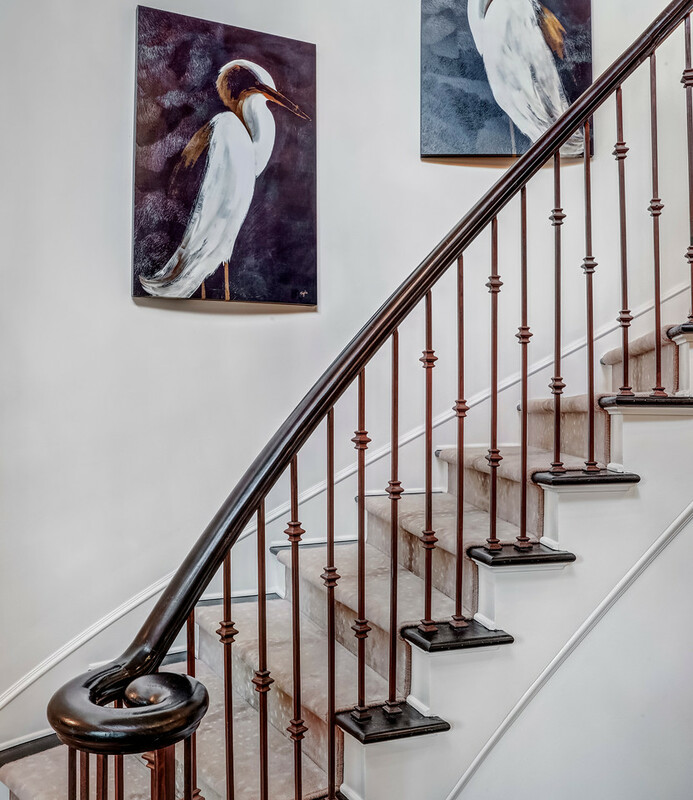 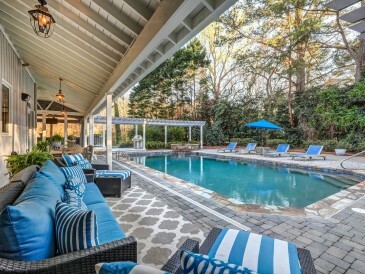 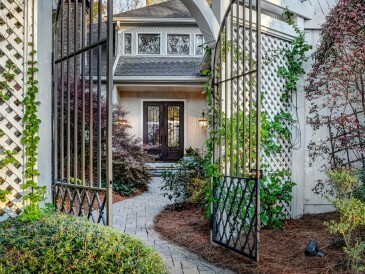 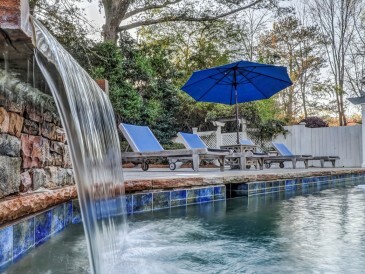 Enjoy fishing, boating, kayaking, tubing, hiking trails, bike trails and relaxing in this lush, tranquil setting only minutes to Buckhead, Downtown, the airport and Battery Park.